What if we stopped talking about what to say or not say to one with an illness and just asked people to listen? Laura shares. “Keep on loving one another as brothers and sisters. Do not forget to show hospitality to strangers, for by so doing some people have shown hospitality to angels without knowing it” (Hebrews 13:1-2). We recently recognized Invisible Illness Week in September, a time to celebrate and raise awareness of those dealing with medical conditions that are not visible to others. Invisible: unable to be seen, not visible to the eye. Ignored or not taken in to consideration. Invisible . . . that is a difficult word to digest. Those dealing with chronic or long-term illness have a hard enough time handing the ramifications of such illnesses. But can you imagine being ignored by others? It is difficult to comprehend, but many have been ignored or their illnesses minimized. I could give examples of feeling minimized, but I won’t. When it happens, I feel invisible, hidden, and ignored. And yet, I don’t like attention–there are times I would like to fade in the background. And that’s the paradox–because these illnesses makes us feel invisible sometimes, yet we crave to be treated normally. One of the best things someone did for me since being diagnosed is treat me like a person, not an illness. A former colleague hugged me when I saw him, said “How are you doing? How are your kids?” And then he listened until I asked the same of him. Listening is a great validator. It is easy, free , and produces amazing results. Jesus often listened and was a constant support to those in need. Remember, we are surrounded by our Savior’s love always, and must share that love with others. Prayer: Dear Lord, it is difficult to live with a chronic condition. Help us to live with grace, remembering that You support us. Amen. Laura Seil Ruszczyk lives in New York with her husband of 26 years and her three children. She is a retired elementary school counselor who currently runs a HopeKeepers group at her church. She has dysautonomia, the deregulation of the autonomic nervous system. The autonomic nervous system controls such invisible functions as heart rate, blood pressure, breathing and temperature control. How do you handle your invisible illness on a day-to-day basis? 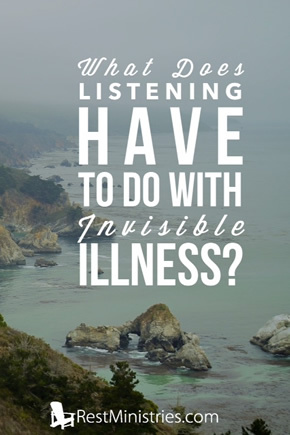 6 Responses to What Does Listening Have to do with Invisible Illness? The timing of this was remarkable! I woke up this morning sensing God telling me to just crawl into His lap and be held. Physical pain, financial stress, and some major problems concerning essential equipment and supplies for our special needs adult son were all weighing heavily on my mind this morning. But as I’ve focused on being held by the Lord, it’s been a day of inner peace. I don’t suffer from invisible illness; my illnesses have caused me to be crippled, to the point where I need to use a walker or wheelchair, and this makes them highly visible. But visible or invisible, chronic illness can be difficult to live with. Whether feeling ignored by others (as those with invisible illness often do), or coping with frequent looks of pity from others (as I often do), dealing with chronic illness is more than just dealing with the physical problems. I’m so grateful that God is with us, holding onto us when we are too weak to hold onto Him. Barbara, please don’t feel like ur wheelchair excludess u from the invisible illness community. I use a wheelchair or crutches and often feel my needs ignored or get told how good i look. It happens to us too. I could really identify with this, Laura. It’s not easy when some don’t understand or if it feels like they think we’re faking since we “look good.” I’m so glad we’re never invisible and always believed and understood by God. Thank you for your understanding. Right on, Laura! VERY well said! Two thumbs waaaay up with much gratitude to you! Many thanks and warm hugs to you, sister! I would like to talk to other people on this site but I haven’t figured out how it works yet. That was so apt for my need tonight. Though Ihave had a CRT a Pacemaker fitted a little while ago, the heart failure seems to be getting worse with energy levels steadily declining which in turn affects other areas. Saw Dr this morning but seems little more they can do. So was feeling pretty low , your message therefore was so helpful. Bless you!!!! !